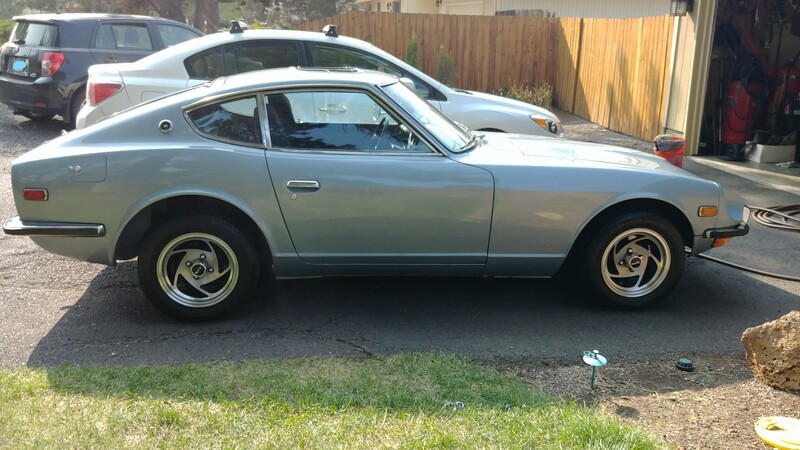 Was finally able to find a clean 240z for myself. Has about a quarter size spot of rust on the entire car that I've seen so far. 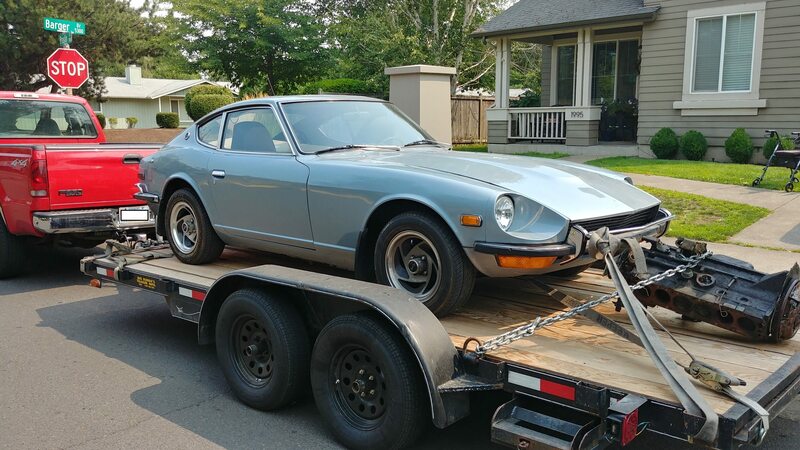 I had been looking around on craigslist but couldn't find anything reasonable or within my price range as most 240z's were going for about 10k+ in my area for a clean one. 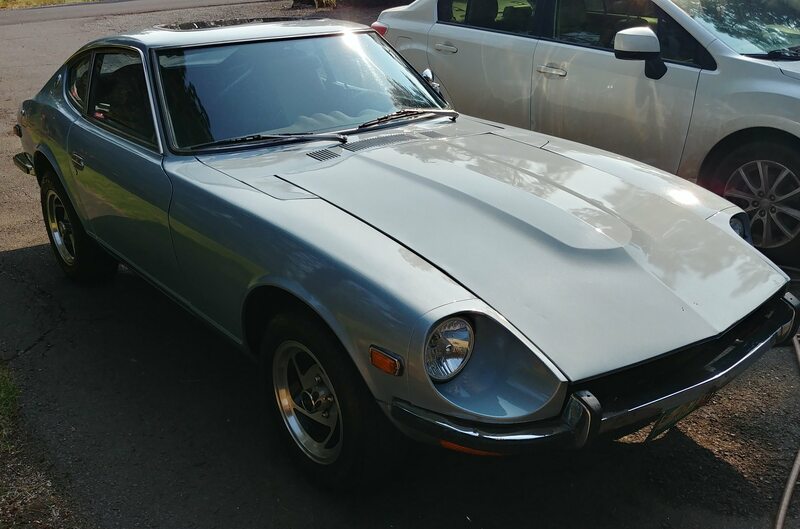 I had put up a WTB ad and a couple days later, a gentleman had sent me an email with a couple pictures saying he is looking to sell his Z. He mentioned a price in the email but I was certain he was either missing a 1 in the front of an extra 0 in the back. He was located about 3 hours away from me so not that far but far enough that if it turned out to not be what I was hoping, it would have been annoying. He did mention that the engine had a knock in it but he had an extra block and a few other parts that he would throw in to the deal. Show up to his house and the price he told me is actually what he wants. Didn't even want to barter on the price in case he came to his senses lol. Trailer the car home and work on diagnosing what kind of sounds like a rod knock but also sounds a bit off. Engine ran fine and didn't seem to vibrate out of the ordinary and the sound would quiet down around 1500 rpms. So my dad and I drop the transmission cause we were also thinking it could be the input shaft bearing making the noise as that is what I had read online being the case for some. Anyways....fast forward till today and I found the cause of the noise.....the flywheel bolts were finger tight!! Thankfully the flywheel didn't shoot off and injure the car or someone. Be sure to use locktite and proper torque specs! So anyways....that's my ramble for now. I'll be working on cleaning up the car as the interior needs some work. It has been repainted about 12 years ago but looks pretty darn good. Will eventually get different wheels. Not sure if I'll keep the bumpers on our not. I don't plan on doing fender flares as I would like to keep car clean and unmodified on appearances for the most part. Once I get the cosmetics to where I want, then I will work on upgrading the engine performance but nothing too crazy. And of course, here's a picture of the car. I'll add more when the car isn't sitting on jack stands waiting for clutch parts. I'll be using this thread to keep track of my progress. Score! Looks to be a VERY nice car. Congrats! Took a few days but the clutch has been replaced and the flywheel resurfaced. Was able to put it all back together last night and took it for a little test drive around the block. Other than the valve cover leaking oil onto the exhaust, everything seems to be working. Gasket should be here tomorrow so hopefully before work I can fix the oil leak. - Change the muffler as the current one is horrendous. Will probably save for a header back exhaust. - Need some new emblems as the current ones are either peeling or missing. -Replace Door Cards as the vinyl is peeling on them. I found the original owners manual with the purchase date and origin. Came from New Jersey which I thought was kind of cool. Made its way to California for a while and then to Oregon where I picked it up. I think that's it for now. I'll keep updating this as tasks are completed for my records. Will add some more pictures later after washing the car. Edit: Crossing off things now completed. Ordered some Konig Rewind 15" wheels from thezstore which was the best price that I could find. Hoping to see those in about a week or so. Was able to get my idle rpms down after finding the idle adjustment on one of the carbs was decently higher than the other one. Sits about 900-1k rpms now based on the tach. Replaced the valve cover gasket so no more smoke from under the hood! Also was able to hook up the power antenna. Can hear a clicking noise coming from it but doesn't move so will probably have to order a replacement at some point. Antenna should go up when radio turned on, down when turned off. Mine has a manual switch that you press to move it up and down it looks like. I don't have a radio installed in it either to see if its the automatic version. Is there a way to bypass the radio to trick it into going back down? I like that 240Z. It looks really good in blue. Been busy with some other stuff lately but finally got around to putting on the new wheels and tires. Ordered some suspension bushings since about half of them are rotted out. Also ordered some new door panels but forgot the clips so waiting on those now. Should be swapping in a 5 speed this winter and am toying with the idea of putting my e88 head on an l28 since my l24 is pretty tired. Looked at the rust on the passenger floorboard and found it was worse that I thought so it will need to be replaced. I could probably do it myself but I'll take it to a shop to have it done correctly. Picked up an N47 head, l28 block and a bunch of other goodies to build a engine. Friend I bought it from claims I should be making right around 250 horsepower which im sure is on the high side. Lots of lightened parts too which I'm looking to see how it feels as I'm only ever had stock components before. He also threw in a 5 speed transmission. Will be a good winter project and hoping to have everything assembled and installed for next summer. Installed a sound system in the vehicle. Purchased some kick panels with speaker cutouts and put 2 5.25" up front, 2 6x9s in the rear and have a rear panel speaker ordered to make it more flush looking although that part is on back order and have no idea when it will arrive. Also put in a 1000 watt amp to help power everything as well as one of those hidden sub box unit things. Everything sounds pretty good to me. L28 head has been taken to get ported and polished and should help with the flow for the new build. Once that is back, just need to install the piston rings and gap those accordingly and then should be able to start assembly of the engine. 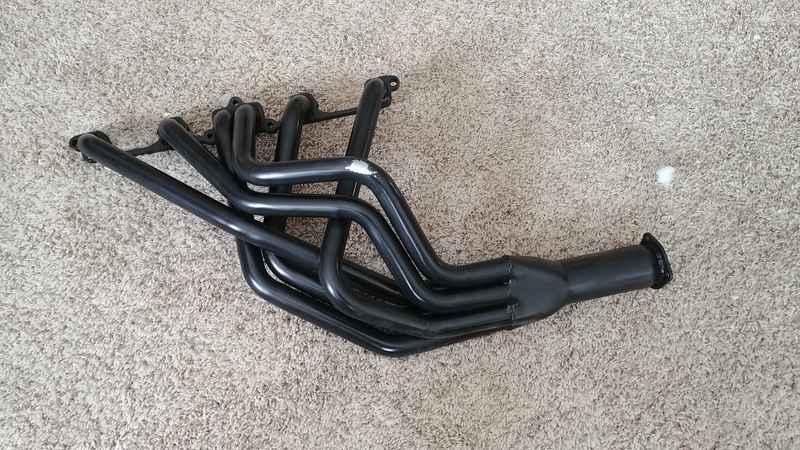 Just ordered a header back exhaust that is 2.5" to help with exhaust flow and have some 6-1 headers for it as well. Been going slower than I was expecting but should still be able to get what I want done before summer rolls around again. Pretty sweet looking Z! You know you scored when you can still find a good deal on a Z in these times when they are going sky high. Removed the current exhaust. 2 exhaust hangers were not even attached so only thing holding it up were the muffler and exhaust manifold. 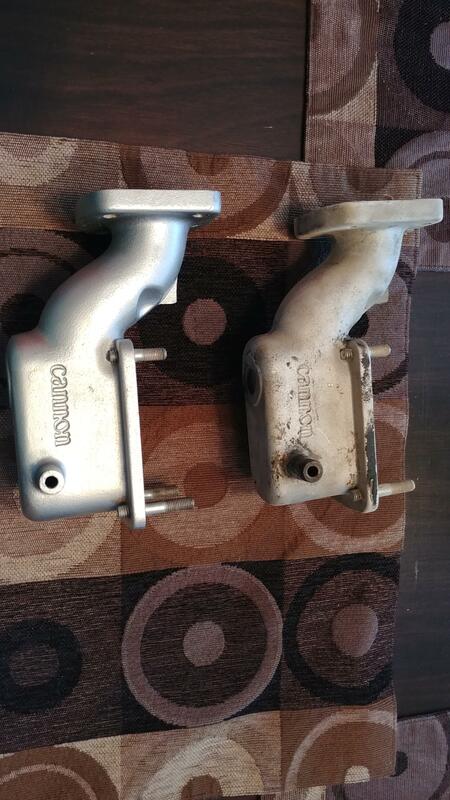 Will be cleaning up the intake and carbs so there isnt any gunk on it. Also painted the brake calipers. Will be upgrading the brakes in the future and swapping to rear disc. Picked up a sand blast cabinet to help clean up some of the parts. Have had the flu for the past week and my area got hit with 30+ inches of snow in about 4 days so things have been a little slower than I would have liked. I have taken apart the intake and will be getting new gaskets but am having a hard time finding the gaskets for the car. As far as I can tell, I have this redline kit on the car that a previous owner had installed but I can not find the blue gaskets anywhere. Anyone know where I can purchase these gaskets at? Header finally arrived after being stuck at FedEx for the last 3 days due to the weather. 6-1 MSA Header that will bolt right up with their exhaust system. Hoping to get it all on later today. Also just realized that I have the E31 head which shouldnt be there since my car is a 72 so someone swapped it some time in the past. 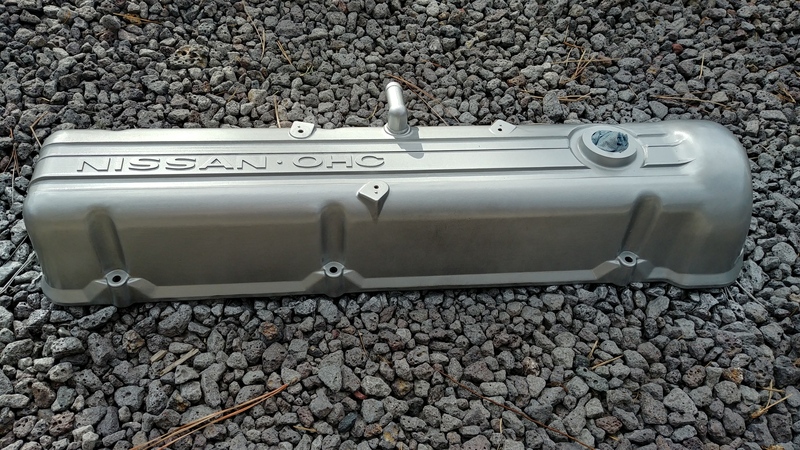 Here is a little before and after of one of the intake pieces. Will be looking a lot better with it all cleaned up. Put everything back together and started the car. 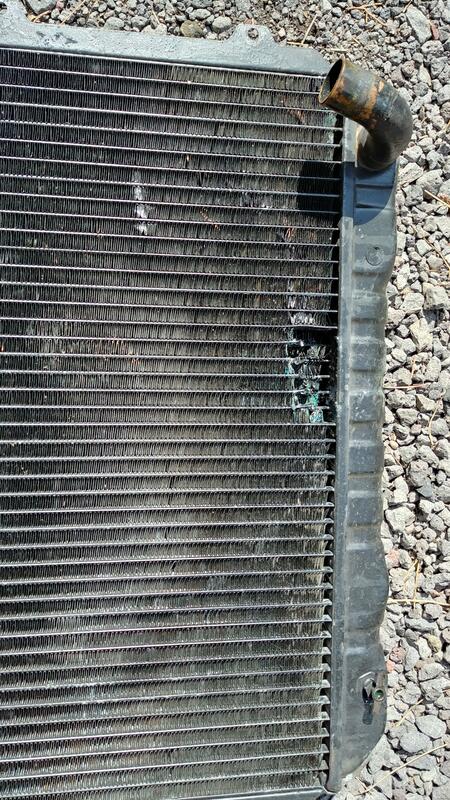 Free plugs on the bottom of the intake leak now after being cleaned up. No one is town has 16mm plugs so I had to order some....hoping they show up quickly but will have to miss cars and coffee this sunday. Intake is off at a shop to get matched up with the head to flow better. 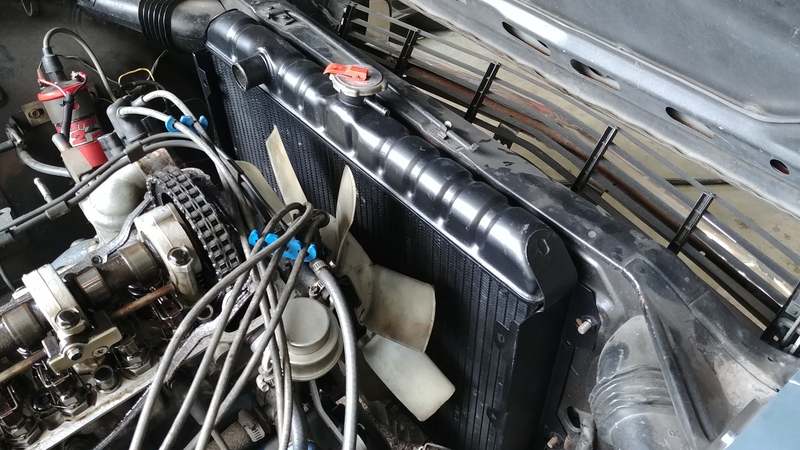 Replaced the radiator with one that doesn't have a gouge in it and then cleaned up the valve cover.